For guests who enjoy a little more privacy and calm, this petit and homey 25 room boutique hotel in Hanoi is conveniently located in a little sublime street lined with small boutiques selling luxury goods. Unlike other streets in the Old Quarter, Hang Ca street is a quite little hub where few trading occurred in the early days. 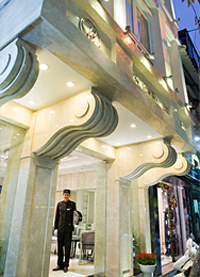 For travelers who enjoy the thrill of walking and the sweat of soaking in the local atmosphere, yet just a "stone throw" away from Dong Xuan market, Church Boutique Hotel Hang Ca is ideal haven to stay. For your accommodation in Hanoi, Church Boutique Hotel – Hang Ca offers an intimate number of 17 guestrooms comprising 13 Classic Rooms and 4 Deluxe Rooms. Classic Rooms offer a choice of a queen or 2 single beds whereas Deluxe Rooms with its more spacious interior offer king size beds. All units overlook either the internal courtyard or Hang Ca Street and feature flat screen TV with international satellite TV channels, wireless and cable internet access, mini-bar, complimentary tea and coffee making facilities, in-room safe, hairdryer, and individually controlled air conditioning. Classic Room offers a choice of a queen size beds or 2 single beds. Each of these comfortably appointed rooms feature bathroom with rainfall shower, flat screen TV with international TV channels, cable and wireless internet access, mini-bar, complimentary tea and coffee making facilities, in-room safe, hairdryer, and individually controlled air-conditioning. Enjoying your stay with Church Boutique Hotel – Hang Ca is everything to us. That is why we take so much pride in our all day dining café as we do to our rooms and other guest facilities. L'eglise Petit, offers local flavours and International cuisine that could surely satisfy even the most discriminating taste. Copyright © 2003 - 2015 Vietnam Hotels and Reservation Vietnamhotels.biz .